Real-time Voice of the Patient programs provide pharmaceutical patient services teams a lens into the thoughts and sentiment of their patients. Although the core philosophy is the same (become more patient-centric, better serve the patient throughout the treatment journey, increase adherence and positive outcomes, etc. ), the data collection methodology can vary greatly depending on the overall goals of your real-time Voice of the Patient program and the specific outcomes you want to drive. Sometimes the most effective methodology is also the simplest. The beauty of the generic survey link lies in its flexibility and speed to market. First – what is a generic survey link? A generic survey link is a unique URL that directs a potential respondent directly to a digital survey where they can provide feedback. The survey response is not usually tied to any type of operational or patient data (e.g. time on therapy, what drug they’re taking, associated case manager, the site they are receiving treatment, etc. ), and there are no sample file requirements needed to launch. Generic survey links can be shared on physical and digital marketing materials, emailed directly to marketing opted-in patients, shared with patients in-person on a kiosk or iPad, embedded into an online patient portal and more. This approach also provides patients who may not have internet access the opportunity to provide feedback directly while they’re at a physical location receiving treatment. A multinational pharmaceutical company wants to collect feedback from a diverse patient population participating in an ongoing clinical trial. The pharmaceutical sponsor does not have access to patient contact information, and the need for a technical hookup with each of the hundreds of clinical trial sites renders automating the patient feedback program impossible. The survey is designed, programmed, and distributed on marketing and educational materials and within the company’s patient portal. The survey collects feedback on the patient experience before, during, and after the trial to improve the design, execution, and recruitment strategy for future clinical trials. In some cases, our pharmaceutical clients want to quickly set up a feedback program based on a corporate initiative to measure and improve the satisfaction of their patients. In these instances, an Interactive Voice Response (IVR) survey program is an effective way to start measuring overall patient satisfaction at a transactional level, and thus, begin the journey to continuously improving the patient experience. When we talk about "overall satisfaction," what we’re really measuring is overall satisfaction with an experience the patient recently had with your company along their patient journey. Many pharmaceutical companies have a team of case managers who support patients with access services, financial support, disease state and administration education and more. Whether these services are internal or routed through a HUB, a transactional IVR survey can capture valuable in-the-moment feedback on a patient’s recent experience. How does it work? An IVR integrates into your company's internal phone system. Before their call is connected, the patient will be asked if they would like to stay on the line to provide feedback on their experience once the call ends. If they say yes, they have consented to participating in the IVR survey. Once the call with the case manager has ended, the patient is transferred to the IVR survey, and is given the option to answer a series of questions about their experience. This process can be automated (i.e. the consented patient is automatically transferred without the case manager initiating), or non-automated (i.e. the case manager has to connect the patient to the survey manually). As a best practice, and if the technical landscape permits, we always recommend working towards an automated IVR survey program. By automating your IVR feedback program, you’re controlling for a major variable that could adversely impact the integrity of your data: case manager or agent bias. In non-automated programs, the case manager or agent will manually transfer consented patients to the IVR survey upon completing the call. This leaves the door open for a case manager to choose not to transfer a patient after a call goes poorly. Controlling for this type of bias is an integral component of the up-front program design process. When the survey is completed and the respondent hits "Submit" on their phone, the feedback is automatically uploaded into a patient experience feedback dashboard (like PeopleMetrics). The down side of IVR surveys is that best practices generally limit surveys to having between 3 and 5 questions. However, system integrations with the IVR program can allow you to associate patient information (with respect to PII/PHI) and operational data to the response. This allows you to analyze responses with advanced segmentation for added insights. A US-based pharmaceutical company in the rare disease space is launching its first approved product. The product is approved in August and the first patients are expected to be onboarded the following month. With an extremely small patient population, measuring overall patient satisfaction with the interaction between the patient and his/her case manager is a priority. Immediately after specific telephone interactions, patients who consent to provide feedback are directed to a telephone survey, and the feedback is used to improve future interactions and coach case managers to better support each patient. The pharmaceutical company is able to begin collecting topline data in ~1 month and work towards corporate overall satisfaction goals. For our pharmaceutical clients who are looking for a best-in-class approach, automated email surveys provide immense value. Similar to the IVR approach, the email survey is triggered off an experience the patient has with your company. The transaction is logged, sample is generated, and the email survey is sent. There are a couple advantages to the email survey program approach. The first is ease of use for the patients. Email surveys allow patients to receive and respond to the survey on their own time. This ultimately has a positive impact on response rates. Instead of limiting a patient to responding immediately after a phone call (IVR) or after spending hours at a facility receiving treatment (generic survey link on an iPad), patients can enjoy the survey experience in the comfort of their own home, on their own time. The second advantage is in the depth of email survey programs. The insights do not begin and end with patient feedback data—you can also tie any operational or employee data point to an individual patient's survey response data, thus enriching the insights you can draw. All names and data in the above chart are fictitious. A global pharmaceutical company wants to understand the experience of new patients enrolled in its patient services program. The company specifically wants to gain a baseline understanding of the experience for newly onboarded patients (their needs, perceptions, and suggestions for improvements) on an ongoing basis; and improve every day interactions by enabling their patient services team to take immediate action on patients who indicate a negative onboarding experience. The company institutes an ongoing survey via email to all new patients following their onboarding calls. The survey is designed to collect feedback on all key aspects of the patient onboarding process, as well as provide patients with an opportunity to provide open-ended feedback. Learnings from the program identify that the relationship with individual case managers is a key benefit for patients—thus employee retention and maintaining assigned case managers is key to patient satisfaction. Given that these are new patients, higher frequency of contact and additional resources around their condition are also essential. Sometimes the right answer isn’t any single methodology. A core principle of the customer experience industry (and now the patient experience industry) is meeting your customer (or in this case, patient) where they are—or where they’re most likely to provide feedback. For example, if you want to track the patient experience across the entire treatment journey, it will be most impactful to trigger an email survey after a patient hits a key milestone. Then you can tie that email survey feedback to operational, employee and (de-identified) patient information. This allows you to get to the heart of insights that truly drive value for patients across the treatment journey. If you’re also interested in collecting feedback from patients on their experience at a treatment center, that is a very different sub-set of questions and it will make more sense to execute on an iPad or kiosk at the physical location where they’re receiving treatment. Finally, if you want to round out the program with a call center-style survey for when a patient calls in for treatment information, logistical questions, billing concerns, etc., transferring the patient directly to an IVR phone survey while the interaction is still fresh in their mind is best. The most impactful programs we manage at PeopleMetrics employ multiple data collection methodologies to maximize the patient's opportunity to provide feedback. 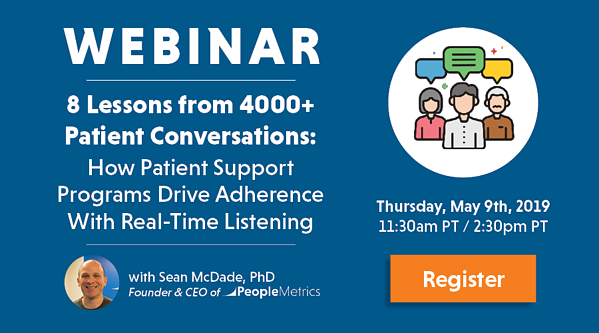 The goals of your program, current IT landscape, and the unique characteristics of your patient population will ultimately determine the methodology and channel(s) you employ to collect patient feedback for your real-time Voice of Patient program. Working with an experienced partner to design and manage your program can help you navigate the nuances of collecting patient feedback in highly regulated industry like healthcare. Before deciding who to partner with or how to collect patient feedback, you must first decide to collect patient feedback in the first place. When approached correctly, it’s extremely easy to get started, but it's also easy to push to the back burner as a "next year initiative." In our experience, companies who are already listening to patients and incorporating their feedback into strategic conversations are seeing extraordinary results.